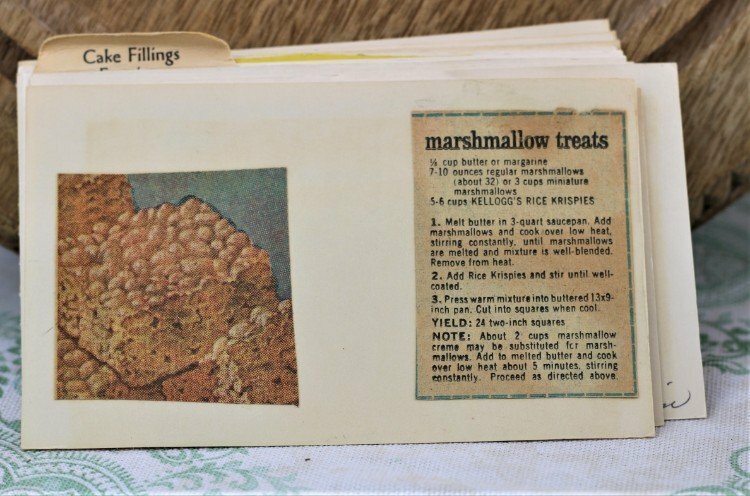 Front of the recipe card for Marshmallow Treats. There are lots of fun recipes to read in the box this recipe for Marshmallow Treats was with. 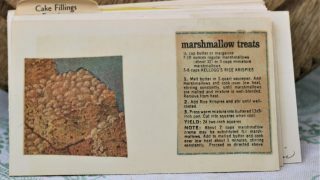 Use the links below to view other recipes similar to this Marshmallow Treats recipe. If you make this Marshmallow Treats recipe, please share your photos and comments below! Melt butter in 3-quart saucepan. Add marshmallows and cook over low heat, stirring constantly, until marshmallows are melted and mixture is well-blended. Add Rice Krispies and stir until well-coated. Press warm mixture into buttered 13x9-inch pan. NOTE: About 2 cups marshmallow creme may be substituted for marshmallows. Add to melted butter and cook over low heat about 5 minutes, stirring constantly. Proceed as directed above. Previous Post: « Carrot Cake Recipes, Tips, and More!! !